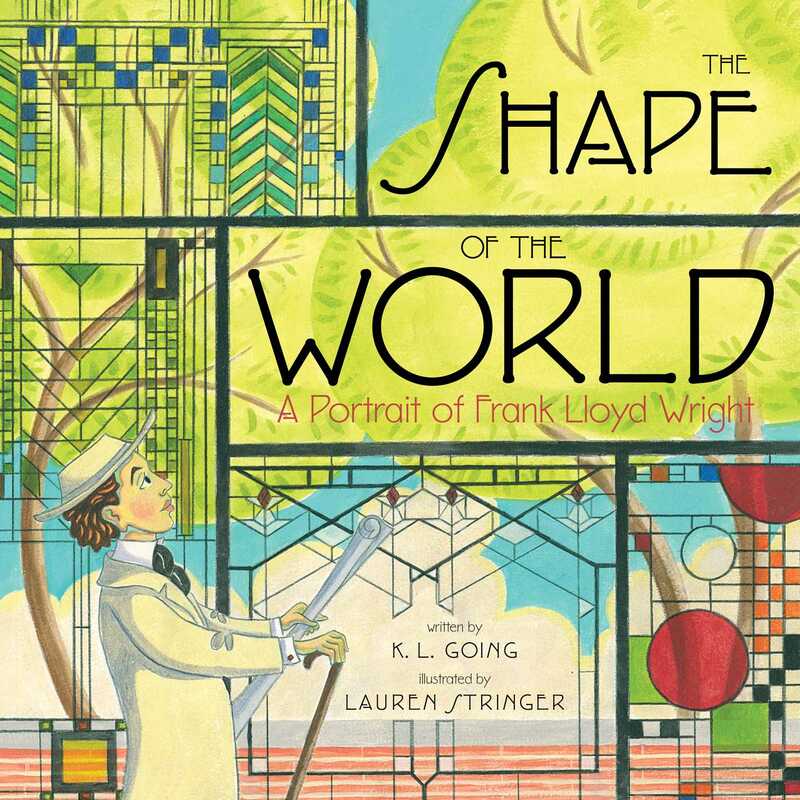 A little boy who loves to find shapes in nature grows up to be one of America’s greatest architects in this inspiring biography of Frank Lloyd Wright. When Frank Lloyd Wright was a baby, his mother dreamed that he would become a great architect. She gave him blocks to play with and he learned that shapes are made up of many other shapes. As he grew up, he loved finding shapes in nature. Wright went on to study architecture and create buildings that were one with the natural world around them. He became known as one of the greatest American architects of all time. K.L. Going is the author of many critically acclaimed novels, including King of the Screwups, The Garden of Eve, Saint Iggy, The Liberation of Gabriel King, and Fat Kid Rules the World. She lives with her family in Glen Spey, New York. Visit her at KLGoing.com. Lauren Stringer has illustrated many celebrated picture books, including Deer Dancer by Mary Lyn Ray; The Princess and Her Panther by Wendy Orr; Scarecrow and Snow, both written by Cynthia Rylant; as well as her own Winter Is the Warmest Season and When Stravinsky Met Nijinsky. She lives with her family in Minneapolis, Minnesota. Visit her at LaurenStringer.com. This picture book biography of Frank Lloyd Wright addresses the question: Do seeds planted early in life bloom into greatness? Wright’s mother decorated the walls of his nursery with pictures of architectural marvels and gave him the toy that would most spark his imagination: a set of wooden blocks. Readers witness a young Wright creating elaborate designs with his blocks and discovering through play how shapes are made of other shapes. Later in life, while performing manual labor on his uncle’s farm, Wright kept his mind busy by pondering connections between geometric shapes and the natural world around him. When he became an architect, he synthesized these sensibilities into buildings that were remarkable for their fluid yet geometric design, in harmony with the landscape around them. The text makes no mention of more controversial aspects of Wright’s life; Going’s focus on a successful career born of childhood passions keeps the narrative child-friendly and seamless. Acrylic, gouache, watercolor, and colored pencil illustrations depict many of Wright’s more famous structures, such as Fallingwater and the Guggenheim Museum, using earth tones that reflect Wright’s reverence for nature. The book is designed in a square format, echoing Wright’s distinctive red square signature. VERDICT A pleasing addition to picture book biography or art collections for children. In a biography both concrete and touched with whimsy, Going introduces Frank Lloyd Wright, first as the boy who became intrigued with shapes, and then as the man who changed the world of architecture. As a young boy, he was given Frobel Gifts—wooden blocks—a cube, sphere, pyramid, and cylinder. A robust two-page spread shows young Frank stacking, building, and knocking them down. He then realized single shapes could be put together into many other shapes. Frank saw shapes in nature as well: triangles in spider webs and hexagons in honeycombs. The observations delight as well as linger, and a grown Frank, still inspired by his childhood blocks and memories of life out of doors, uses these ideas in his career as an architect. “When other architects chose walls, he chose windows,” says Going, and, indeed, the illustrations show Wright’s intricate glass creations from his many structures (identified in the back matter). Although some of the depictions of his buildings, several to a page, are too small to appreciate, they do generate an overall sense of the artist’s range. The simplicity of Going’s words work neatly in tandem with Stringer’s artwork, reminiscent of illustrations of the 1930s and 1940s. A spot-on introduction to Wright and an evocative recognition of the way a child is father to the man. A boyhood fascination with shapes and nature informed the hundreds of structures Frank Lloyd Wright would go on to design as an architect. Going and Stringer thoughtfully examine those twin influences through this biography’s poetic text and handsome illustrations. Created with pencil and paint, Stringer’s layouts draw on the geometric shapes and strong horizontal lines of the Prairie School movement; several of Wright’s famous buildings, including Fallingwater and the Guggenheim Museum, appear throughout (a closing guide identifies these and other structures). Going, meanwhile, emphasizes the curiosity, questioning, and observation that shaped his designs: “He never forgot the smooth weight of the blocks his mother had given him when he was a boy. He remembered the hills and prairies surrounding his family’s farm.” A lovely introduction to the work of this trailblazing architect. In Going’s title, young Frank Lloyd Wright is encouraged by his mother to investigate shapes, and as he fingers the smooth wood of his building blocks, he comes to understand how shapes fit within shapes and, later, how that arrangement works in nature. When he became an architect, this perspective manifested in the angular cantilevers of domestic architecture nestling in wooded settings, in “towers as tall and thick as trees,” in windows that admitted the outside rather than walls that excluded it....[the] illustrations reflect the designs of their [subject]...[and] incorporates the architect’s imagination at play alongside actual buildings come to life...supplies a list of resources and closing author notes. childhood, spent playing and dreaming in forests and fields and building with geometric blocks, was the foundation of his work and his long and illustrious career. She writes lovingly and rhythmically (“Raindrops made changing shapes— clear and cold. Lightning made jagged shapes—sharp and burnt. The river made smooth shapes—long and curved”), but she avoids a tone of hero-worship and never names Wright. He is “the baby,” then “the boy,” and then “the architect.” The illustrations make the historical and personal setting specific, but in the text he could be any imaginative, aware child. Stringer’s warm and accessible pictures show Wright at various stages of life against backdrops that nod to his designs. Every aspect of the book is thoughtful, from the square trim size to the color palette to the typeface based on lettering designed by Wright. Author’s and illustrator’s notes, a list of sources, and a key to the Wright buildings and structures incorporated into the illustrations round out this inviting introduction.